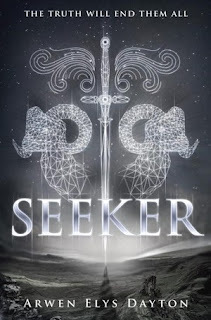 Dayton, Arwen Elys Seeker, 435 pgs. Delacorte Press, 2015. $18.99. Language: PG (0 swears); Mature Content: R (drug use, prostitution); Violence: PG-13 (battles, graphic deaths). Tonight is the night. Quin, Shibonu and John have been training for years with Chin’s father, Briac, and Shibonu’s father, Alistair, to become Seekers, protectors of good people from harm. Generations of their families had taken the Seeker oath and now is their time. Once sworn, Quin and Shibonu realize that Briac has evilly twisted the purpose of Seekers. The keys to the Seekers’ power to travel through time and space are two tools: an athame and a lightning rod. John demands it to restore his family’s power, Briac will kill for it to use for evil and Quin has it. Can Quin and Shibonu restore the Seeker’s noble purpose and not be killed? Gripping writing opens this book and the pace does not slow down. The book’s three main settings evokes three different sub-genres of fantasy: the training in Scotland – medieval/historical; Singapore – gritty realism; and London – Steam Punk with blimps. The weapons are futuristic and the fighting is graphic. A well done fantasy with a sequel, Traveler, due in spring of 2016. 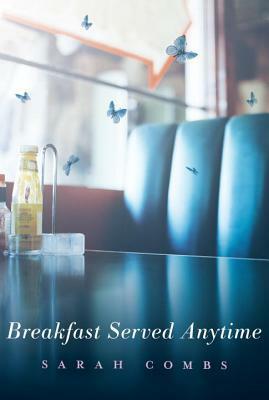 Combs, Sarah Breakfast Served Anytime, 261 pgs. Candlewick Press, 2014. $16.99. Language: R (50+ swears, 0 “f” ; Mature Content: PG; Violence: G.
Gloria has been chosen to attend “Geek Camp” at the University of Kentucky for the summer. She enrolls in a session called “Secrets of the Written Word”, which is a small group of 4 students whom Professor X has asked not to bring technology of any form. Gloria meets and bonds with her roommate and her classmates, even the boy who annoys her. This book is about relationships but none of them feel very realistic. Gloria labels everyone immediately and not often flatteringly but becomes instantly close to her classmates and her beauty contest contestant roommate. The characters seem token (mysterious professor, lesbian classmate) and the few issues are dealt with too briefly. This could have been a good book for students looking for a gentle story but the amount of swearing will put them off. 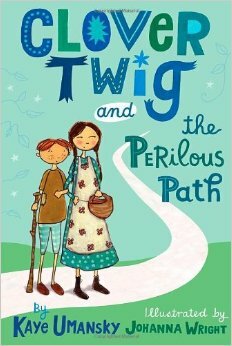 The sequel to Clover Twig and the Magical Cottage finds Clover once again caring for a witch named Mrs. Eckles. Not far into the story however, Clover must bravely voyage down the Perilous Path to save her little brother and foil the plans of the wicked Mesmeranza. Without having read the first installment, the reader could enjoy the adventures of this clever heroine. There are several subplots to keep track of, which at times slows the pace of the main action. The resolution was unexpected, although somewhat anticlimactic. Overall, a clever, quirky story with a delightful sense of humor. 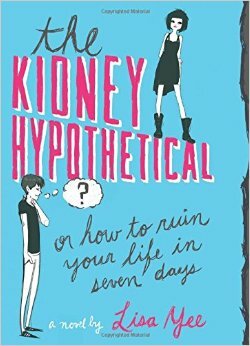 Yee, Lisa The Kidney Hypothetical, 266 pgs. Arthur A. Levine Books, 2015. $17.99. Language: R (81 swears, 16 deity, 4 "f's", other mildly crude language) ; Mature Content: PG-13 (drinking, smoking) ; Violence: PG. In just seven days, Higgs Boson Bing will graduate from high school and he is on top of the world. He has been accepted to Harvard, has won many of the top awards at school, is dating Roo, one of the prettiest, most popular girls at school, and is pretty sure he has the Senior of the Year award in the bag. Then everything falls apart. 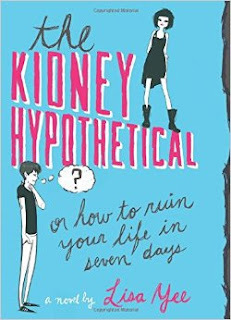 When his girlfriend asks him a hypothetical question -- would you give me one of your kidneys -- he doesn't answer yes because it's just a hypothetical question. He has no idea that one comment will start the beginning of one of the worst weeks in his life. Everything goes wrong from Roo storming off to some serious harassment at school to Harvard calling to re-evaluate his acceptance. And his family seems to be falling apart. Then he meets Monarch. She won't tell him her real name, but he finds her compelling and interesting and she makes him question what he really wants and who he is trying to make happy. On one hand, I enjoyed this book, read it in one sitting and found it quite amusing. On the other hand, there were several things that seemed over the top. Does your girlfriend of two years, cry , stomp off and not speak to you again because you won't hypothetically give her a kidney? Do you experience such vitriol from your classmates because of it? Does the administration at school really treat you with such disdain and act as though you are getting what you deserve? If they truly believed Higgs didn't deserve the things that he achieved, why wait until his very last week of high school to let him know? I thought Higgs was likeable, not perfect, but he did learn a few things about himself, and there is a satisfying end to the story. Betts, A.J. 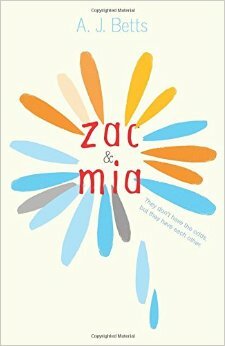 Zac & Mia, 310 pages. $18. Houghton Mifflin, 2014. Language: R (122 swears, 69 F); Mature Content: PG-13; Violence: G.
When I first started Zac & Mia, I thought it would follow the normal cancer book routine. Which would mean the characters spent most of the book inside the hospital. Though I was happily proven wrong. I really loved how both Zac and Mia carried on with their lives outside the hospital. It gave the reader a chance to see what happens after treatment ends. The book was told in three parts, the first from Zac's point of view, which I loved. Once the book entered the middle section with both points of view, I was not as into the story as I had hoped, but it quickly regained that 'pull' once the third part (Mia's point of view) had started. I loved the way Zac and Mia got to know each other in the beginning of the book, the 'knock and tap' concept was so heartwarming and It was done in just the right way. Every knock form Zac seemed to say something different and calming. I was sucked into the story and just couldn't put it down! Since it was set in Australia, I loved the terms A. J. Betts used, it was so fun! The book had such smooth transitions between parts and I really thought I knew the ending, until I didn't... Over all I really liked the book! I loved all of Zac's 'googled' statistics. They followed through the book and really made it unique. It is definitely something for older teens because of selective topics and strong language, but it's nothing I wouldn't recommend to everyone!